Bryant Park is one place where overflow parking might take place. Konopa also mentioned the privately owned lot outside the former Safeway store at Pacific Boulevard and Calapooia Street, where arrangements with the owners would have to be made. Another possibility is to wait and see whether there’s a problem at all and then muddle through depending on what happens. About a thousand visitors are expected for the carousel opening on July 25 (which Konopa understood was still a tentative date). But on Thursday nights each July and August, several thousand people cram into Monteith Park for the River Rhythms concerts. Unless they live near the park, all those people found parking and then walked. Maybe the carousel crowds — if any — can do the same. It stands to reason the city council would have addressed this problem before now. They have had years to think about this issue. I have been looking forward to this carousel since 2008! I have to ask, why in the world did you not think of the parking situation back then? I have two bad knees and walking the distance is not an option for me nor is riding a trolly. A better option would have been building and putting it somewhere in Albany much more accessible! No one else could possibly have allowed a facility construction and THEN begin looking at possible parking issues except our city fathers themselves. Is this the old cart and horse question regurgitated once again. WAKE UP IDIOTS @ The city! Make downtown a “bicycles only” destination. This will surely limit Carousel Crowding. Why are they thinking of parking now? A little late I would say. I thought that the Carousl had to have so much parking for how big the building is. I am astounded that the issue is getting thought about after the fact. I have a small business, and we had to prove that we had adequate parking before we could open our doors. Kinda late, isn’t it?! When it comes to Albany city government, some private organizations are more equal than others. The Albany Historic Carousel and Museum, a private 501(c)(3) organization, sits at the top of the pyramid and can get pretty much anything they want, and get away with pretty much anything they want (like no planned parking), from the City. Just make the Post Office an offer they can’t refuse. There’s plenty of money in the CARA slush fund and more could be siphoned from the general fund with creative accounting. Money talks and the postmaster will listen if the Mayor dangles enough cash in front of him/her. Normally Mr. Shadle’s politics are a bit rich for my blood, but on this Carousel-CARA-Parking Scandal confluence, I believe Shadle’s onto a solution even though he offers it tongue-in-cheek. CARA’s pockets are deep. The Carousel was built with the blessing of those who sit at CARA’s cash controls. When the massive scope and grand opulence of the whirling Carousel Mausoleum became apparent, our forward-thinking City Mothers and Fathers certainly considered the potential for parking problems. Their thoughtfulness and vision is the principle reason why these fine folks keep getting re-elected. Certainly none of these key players want to be painted with the old “failed to anticipate parking problems” brush. The CARA gurus should heed Shadle’s suggestion and hand the USPS a large pile of unmarked bills to get them to move. If the money is big enough, we could start paving-over the Post Office lot by July 1st. Good idea. Having CARA cash out the PO is a wash from a tax increment perspective. Of course we still have to ignore the inconvenient fact that replacing a tax-generating property owner with a private 501(c)(3) organization results in a NEGATIVE tax increment. But no one at CARA or City Hall seems to understand or care about TIF, so let’s double down and get that slush money circulating. And I suggest the city charge at least $10.00/hour parking on the new lot. This has the additional benefit of growing city government because a new bureaucracy will be required to manage/regulate the cash cow. A win-win-win for bureaucrats and their apologists. “The mayor” is so positive the Post Office is going to pack up and move,she has her own “study group” picked to agree with her. It’s just the majority of the mayor/council thinks they can create unfunded debt and force us to pay it later or go bankrupt. Approximate round-trip walking numbers: 3000 feet – closest parking area in Bryant Park to and from the carousel; no need to cross any streets. At a typical walking stride of 2.5 feet, that’s only about 1/8 of the often-stated, desirable 10000 daily steps. At a very slow walking pace of 2 MPH, only 17 minutes both ways. A possible problem is that watching the waterfall and water works from both sides of the bridge is irresistible (at least to me, on my bike). Traffic is often too fast at that spot, considering the narrow railway underpass and bridge, park entrance, poor sightlines, and distractions. As an occasional bicycling visitor from Corvallis (most recently last Wednesday evening), I find downtown Albany, the waterfront, and nearby neighborhoods more appealing than anything similar in Corvallis. Please appreciate the treasure you have and don’t ruin it with too many and too-large parking lots. One imagines a noisy, diesel-spewing line of shuttle buses decorated in the manner most closely associated with the Chamber of Commerce marketing department. Four or more Union bus operators with associated pension costs will be needed; those drivers need management. You can see where this is all heading. The Mayor had best call in one of the many favors she’s owed as a result of her having kept mum after witnessing who knows how many depravities. After all, the Post Office is not God Almighty. Grease the proper wheels. Miracles do happen. The ol’ adage “if they build it, they will come” is upon us. Our mayor, give her credit despite not knowing a thing about cannabis plants growing harmlessly in citizens backyards, KNOWS parking will be an issue. Why else would she be proactive in moving the mighty P.O. ?? I hope it all “trickles down” to our downtown Albany businesses. SINCERELY! aside..HH…is your web admin pushing us new advertising? PhpStorm? Enjoy Productive. ??? What is that? Missing verb. The Mayor and the Council are to be congratulated for their visionary thinking. Before the imminent opening of a carousel the townspeople are up in arms, imagining traffic jams and panhandlers fouling First Street. The Leaders knew the criticism would be heavy, yet they stood up, deflecting the barbs slung by the barbarous. 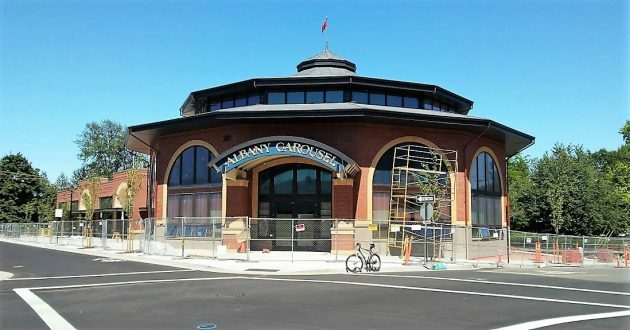 In the end, Albany will have it’s Mighty Carousel, traffic jams be damned. You can’t stop progress, can you? Progress ….no, No you cannot. Can’t stop stupidity either. C’mon along for the ride. Spin around. It will be fun. You like to get dizzy…no?